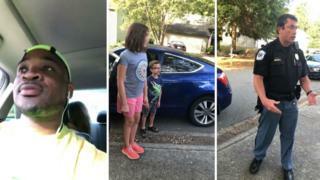 Corey Lewis was leaving a Subway sandwich shop in the US state of Georgia on Sunday with the two children he was babysitting, when a woman approached him in a Walmart car park. The woman asked if the children were OK, and requested to speak to them. When Mr Lewis refused, the woman followed him home and called the police. Mr Lewis is black. The children were white. The incident in suburban Atlanta has recharged the debate about racial profiling in America. Mr Lewis documented parts of the experience in a series of Facebook Live videos which have been viewed more than 600,000 times. In the videos, Mr Lewis says: "It's 2018. I can't step out into the community without being profiled. "I am being harassed and followed... because I have got two kids that don't look like me." He also said that the children were "scared" by the woman following them. In the final video, Mr Lewis is questioned by a police officer by the side of the road. Mr Lewis described the incident as an example of "babysitting while black" and suggests that the only reason the woman contacted the police was because of his skin colour. The videos were met with anger online, with many people commenting that it was "disgusting" and "terrible" that the police were called. Many people used the hashtag #BabysittingWhileBlack to express their anger. 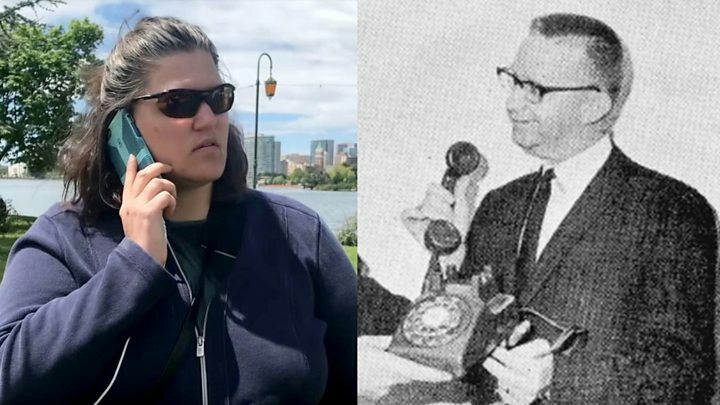 Mr Lewis' experience is the latest of a number of incidents of white people calling the police to report black people for undertaking seemingly normal daily activities. This has given rise to the term "living while black" to describe the criminalisation of black people going about their everyday lawful business. Black people napping, visiting a coffee shop or restaurant, canvassing and selling water have all resulted in the police being called. Dana Mango, the children's mother, told Good Morning America, that she was "in a state of disbelief" when she received a phone call from a police officer asking her to confirm that she knew Mr Lewis. "The officer was actually apologetic," Ms Mango said. "I think he was embarrassed. He saw what was happening pretty quickly. Mr Lewis runs a youth mentoring organisation that teaches life skills to young people with emotional and behaviour issues.